The large mobile crane arrived back at the wharf today. There were five boats to move with one for survey coming out and back in the same day. The other came out for blacking or were going in after blacking and survey. It made for a busy day. 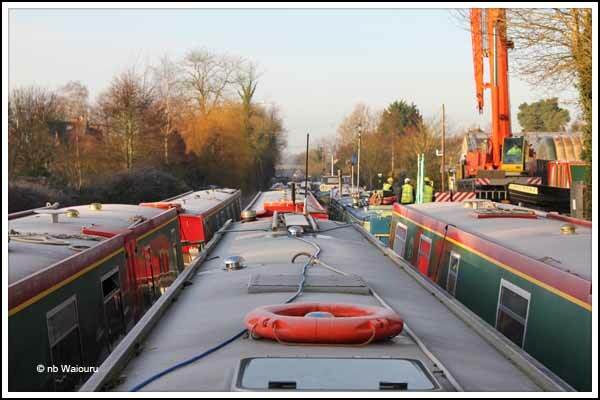 Yes; more frost on the tops of the boat. But at least it was a clear day. NB Benbow was the first to be taken out. 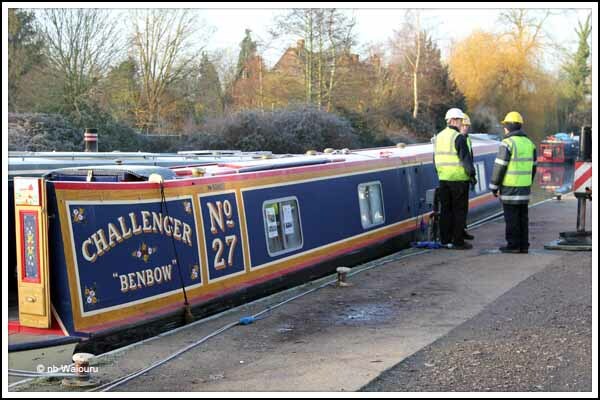 She is a shared ownership boat based at Aldermaston Wharf. The return of the cold weather has reminded us of the need to ensure we have sufficient warm clothing. Jan has now knitted me a second “beanie” out of surplus wool and last night she finished a scarf. 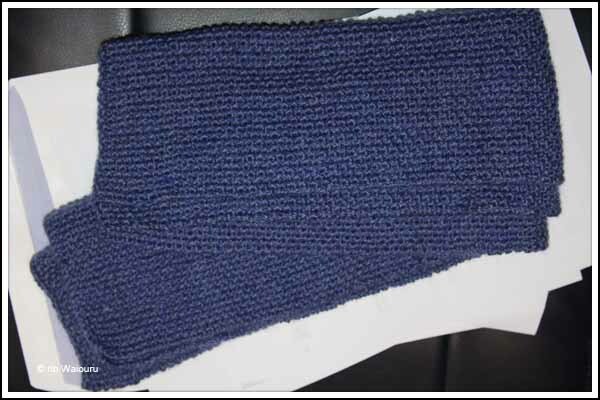 Usually the ends of a knitted scarf will curl up but this scarf is different and the ends lay flat. I asked Jan “Why?” and she told me she had knitted it using ‘moss’ stitch. 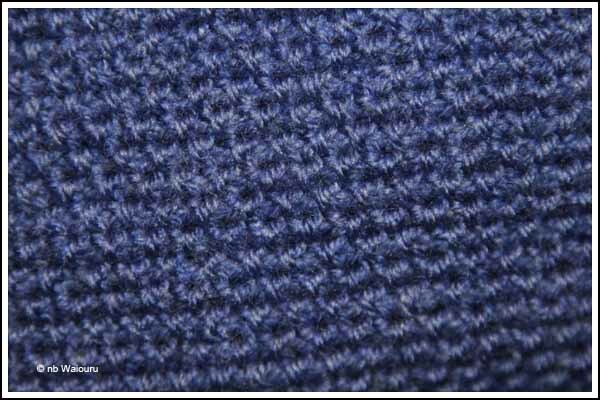 She has probably used this stitch before… but I can’t remember it! Anyway, it works; and the ends of the scarf don’t curl. Actually it’s probably not cold enough at the moment to wear the scarf, although I can imagine it would be necessary when we get to cruise in winter. There will obviously be an additional chill factor from the wind blowing off the surface of the canal. Oh….. I can knit. (don’t tell Jan!). My mother taught me when I was in my early teens. Although the way she tells the story I apparently taught myself to knit left handed after watching her knit right handed. She is 83 and still knits. These days she knits caps for new born babies at the Perth hospital maternity unit where my sister is a midwife. Expectant mother are informed they are required to bring their own caps for their babies. However many don’t; so mum has been coerced into knitting a supply for the ward. Unfortunately there is a significant loss rate so mum has almost a full-time job. At my sister’s suggestion she has been knitting the initials “LW” (Labour Ward) into the front of the small white caps. One of the younger nurses told my sister this was wrong. It wasn’t the Labour Ward but the Birthing Surgery. I know; a fancy new name acquired during one of the many restructures! My sister said “Don’t be daft….. what mother would want the letters ‘BS’ on their new child’s forehead”. Actually, it might reduce the loss rate! But then knitting the initials BS is more difficult than LW.